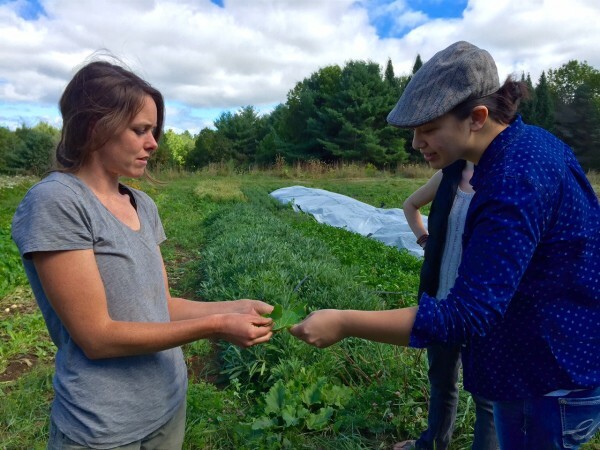 Chef Cara Stadler (left) meets with farmers at Bumbleroot Organic Farm this week in preparation for her upcoming Farm dinners at Tao Yuan in Brunswick. 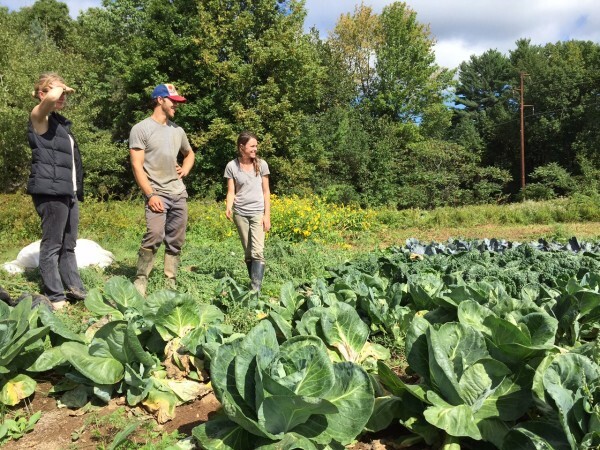 Tao Yuan chef de cuisine Saskia Poulos (left) checks out the harvest at Bumbleroot Organic Farm with farmers Jeff Fisher and Melissa Law. Starting on Thursdays in October the Brunswick restaurant holds farm dinners, a prix fixe local feed celebrating growers and their harvest. Farmer Melissa Law hands chef Cara Stadler an edible leaf to taste in preparation of her upcoming farm dinner at Tao Yuan Restaurant in Brunswick, featuring an all-local menu from farms like Law's Bumbleroot Organic. 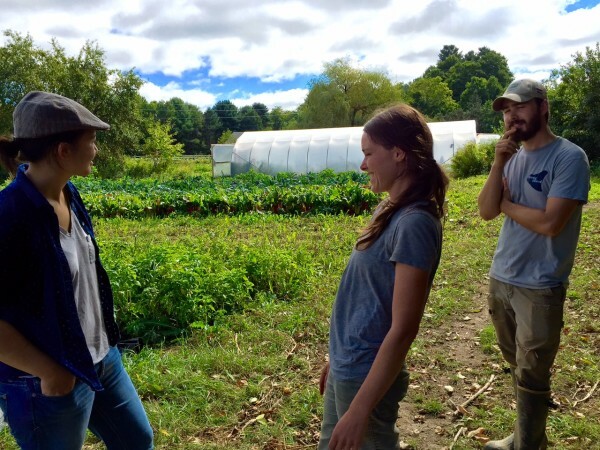 Chef Cara Stadler (left) meets with farmers Melissa Law and Ben Whalen at Bumbleroot Organic Farm to talk about the upcoming farm dinner at Tao Yuan Restaurant in Brunswick, featuring an all-local menu. BUXTON, Maine — Bent down between rows of cabbage, radishes and fennel, farmer Jeff Fisher pulls up a purple daikon radish. Grabbing a pocket knife, he slices the organic root vegetable and offers samples. Standing next to him in a newsboy cap and jeans, chef Cara Stadler takes a bite and the creative juices start to flow. “It’s punchy and super crunchy,” she says. This time of year a farm tour is like a playground for seasonally focused chefs like Stadler, who owns Tao Yuan in Brunswick and BaoBao Dumpling House in Portland. To show her appreciation for the farmers in her midst, she hosts a Maine harvest dinner series next month on alternating Thursdays at her Brunswick Asian fusion hotspot continuing through November. The reverse of farm dinners, like the roving Outstanding in the Field, Stadler invites farmers in to showcase their harvest and mingle with diners over a meal. Served prix fixe ($48 to $68), the menus are not completely developed. How could they be? A week before, Stadler and her chef de cuisine Saskia Poulos will receive a bounty of freshly picked, ripe and ready food from which to create. Seasonality dicates the dishes in her fashionable restaurants. And that is the key to her rise. “People say, ‘Why does your food taste so good?’ And I tell them ‘because I use local ingredients,’” says the two-time James Beard Award nominee and Food and Wine’s best new chef of 2014 . In the food world, quality and local have not always been linked. Relationships such as Stadler’s with Bumbleroot in Buxton tighten the links of the food chain. Melissa Law, one of the farm’s co-owners, is also a server at BaoBao, and can answer most vegetable-related queries from the floor. At Stadler’s farm dinners, how will diners know what variety of cucumber is on their plate? They can ask that couple in the muddy boots seated next to them. On this culinary trip, the farmer who grew it comes with you. 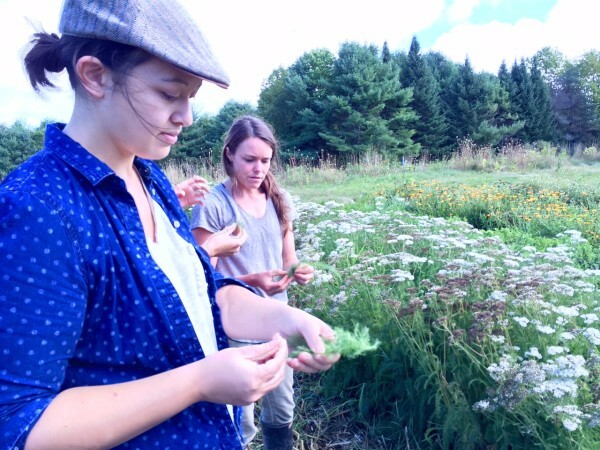 Now in its second year, these farmers appreciation nights will pair produce from Bumbleroot Organic Farm in Buxton with venison from Applegate Deer Farm in West Newfield. On another night, dairy and lamb from Kennebec Cheesery of Sidney will be served with produce and fermented goods from Thirty Acre Farm in Whitefield. This year the series expands to showcase twice as many farms and an extra night is added. On Oct. 15, the chefs tackle an all-vegetarian meal from Six River Farm of Bowdoinham. You can’t get closer to eating local than breaking bread with the man or woman who grew that heirloom tomato, harvested that sweet carrot and nurtured that succulent venison. Seeing how a superstar chef like Stadler, who studied at Le Cordon Bleu in Paris, combines shishito peppers, fresh on the vine that morning, with just harvested meat, for example, is a rush for a farmer who has been digging in the dirt all summer. “We wouldn’t miss it,” said Fisher after giving Stadler and Poulos a tour of his two-acre spread Monday morning. “We love eating as much as we enjoy farming. It’s great to see someone take something we’ve worked so hard on and represent it really well,” said Fisher. To Poulos, a farm dinner “really completes the circle.” Like wine dinners where the vintner is present, “customers like to say hi to farmers,” she’s noticed. Tao Yuan’s harvest dinners are exciting for customers and farmers, but for no one more than Stadler, who deepens what she already knows with new possibilities. To keep food fresh, beautiful and prevalent in Maine, Stadler is working on an aquaponics enterprise — a way to grow fish and plants in a greenhouse all year. Though in its planning stages, she has tapped Holcomb to find an educational partner. They hope to have a solar-powered system up and running this winter. The first step is research. “The idea is to foster a network of anyone who would like to participate in an aquaponics farm-to-table operation in Maine,” said Holcomb. Ideally it would be located on a college campus at first. They hope to make an announcement in November. To make a reservation for harvest dinners at Tao Yuan, call 207-725-9002 or book online at http://tao-yuan.me/reserve.html.